At the end of PART ONE, with driver’s license in hand, I’m ready to select a vehicle. It was as big as a full size American pickup truck, but configured like a van so the driver rode above the front wheels with no hood in the way. The huge tires provided lots of ground clearance and hummed hypnotically as the beast drove past. 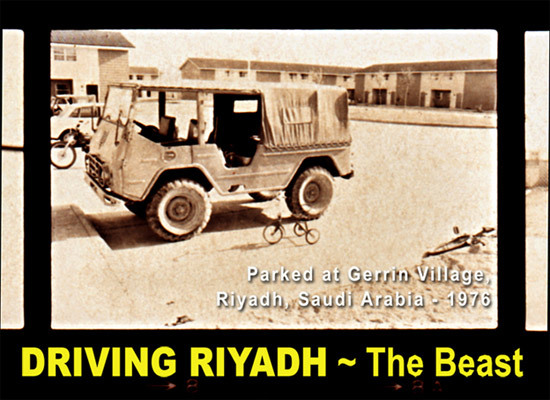 I later learned that it was a Volvo Laplander jeep with a canvas top especially configured for the Saudi National Guard. Sweden sold 600 of them to Saudi Arabia in a late 1960s arms deal. Actually much bigger than a Jeep, the Laplander was an eight-man troop carrier. It was the perfect desert vehicle, the proto Hummer 20 years before its time. Unfortunately, all the Laplanders were owned by the Saudi Arabian National Guard. The next few weeks I became aware of all the National Guard Volvos running around the city, and I was helplessly enamored. I had to have one, but where could I find one for sale? I asked around the hospital. I talked to the Saudi in charge of whisking arriving Americans through immigration and customs, to the skinny. Sharp-dressed Eritrean who worked in local purchasing and knew half of the merchants in Riyadh, and I asked Antar, the huge, always-smiling, Sudanese heavy truck driver whom I met while producing a training video on proper forklift techniques; they all agreed that I needed to go to the Suq al-sayaraat mustamaal – the used car suq. So one day I flagged down a cab and asked him to take me to one of the most astonishing places in all of Saudi Arabia. Located on the eastern edge of town, the suq was bordered on one side with at least a dozen coffee houses and thatched-roof restaurants and a row of shabby car parts stores in a cheaply built cinder block stalls. It faced a huge lot, about half a football field in size, dotted with four-foot-high molehills. Ali bin Trump, or whoever was the landlord, had built them by having a dump truck drop a load of dirt and then spraying it with heavy tar. A few days in the sun, and the tar formed a hard crust that kept the mound in place. The ground was littered with a fine layer of tiny beads of broken glass and colored plastic, nuts, bolts, varicolored wire, flattened juice cans and the like pressed into the good earth which was stained with a range of automotive liquids from brake and transmission fluid to gobs of grease, gasoline and diesel fuel which breathed a sweet bouquet of hydrocarbons into the air. As the cab approached I began to hear a muffled roar. The closer I got, the louder the din became. Finally I emerged from the taxi to behold the most amazing spectacle. There were more than a thousand men milling around, the air was thick with exhaust fumes and burning rubber, the sound of dozens of revved engines, screeching tires, and squalling brakes combined to create a symphony of anarchy. The screams and shouts of scores of men standing atop mole hills with portable PA systems and the strangled responses from the customers provided the chorus of chaos. I was dazed by the energy of the place, by the hundreds of cars on the perimeter waiting for their chance in the arena, by tea boys scurrying out with their full trays, and most of all by the sheer diversity of men and vehicles. Half of the crowd were Saudis, the rest Arabs from Iraq to Yemen, Africans, and Asians – all of them car guys! I could have been at a used car auction in Paducah, Kentucky minus the chaw, Jack Daniels and country music. Everyone was either talking or smoking or doing both. And the cars were from just about every model of vehicle ever made outside of the Soviet Bloc. I wandered over to the nearest auction to see what was happening. Standing on his mound, a husky Syrian with a rich bass voice and rapid-fire delivery was extolling the virtues of an abused Datsun pick-up truck. Standing to one side at the base of the mound the twitchy Saudi car dealer monitored his mouthpiece. The Syrian finished his spiel and waved to the teen-aged Yemeni driver who popped the clutch in reverse and shot 15 feet backwards before slamming on the brakes. He revved the engine and then spat forward, screeching to a halt just before the mound. He laid into the horn to demonstrate that most vital component. He did this repeatedly as the auctioneer raised the bid to past a thousand riyals. The kid came blasting forward again, slammed the Datsun into reverse, let go of the clutch and there was a loud clunk. He desperately shifted, revved the engine, but the truck just sat there making a chunky sound from the transmission that only added to the ambient cacophony. The kid desperately pounded the clutch and pumped the gas, the Syrian screamed at the kid, and the Saudi car dealer harangued the auctioneer as the crowd drifted away. But no matter, there were dozens of auctions going on, each one an individual tableau of auto commerce, Saudi style. After a while I realized that they were selling cars the same way they once sold camels though you didn’t have to examine the teeth and pull out the tongue for careful inspection. Eventually, I encountered a mound mounted by a diminutive, mid-50s Saudi, clean–shaven, in a snow white thobe and no PA system. I’ll call him Abu Ali. A late model Cadillac was being driven away by some Yemeni teenager, while his younger cousin maneuvered in a sky-blue, 1973 Chrysler Imperial La Baron to a collective sigh of approval from the gallery - a much more upscale crowd with lots of young Saudi men in clean thobes and ghuttras perfectly folded into whatever was the snappy style of the moment and Jordanian business men in pressed suits. But of course there was a big crowd of looky loos: toothless Bedu with nothing else to do, Indian clerks, Baluchi mechanics, and lots of guys wandering around aimlessly, lured by the sleek Imperial – like myself. Once the kid parked the car with the engine running, he hopped out of the car and seemingly out of nowhere appeared the demo driver. A very tall Kenyan, maybe even a Masai, maybe named Musa, was dressed from his polished Italian loafers and tan linen pants up to his starched white shirt with French collars attached by red stone cuff links. He slipped into the car like slow mercury and closed the door. He tapped the gas lightly, slid back the seat, adjusted its tilt angle - it had remote control mirrors, so he wiggled them back and forth to set them just right. Normally, by now the crowd would be screaming and shouting to get the auction started; but everyone got quieter as Musa flipped on the headlights and blinked them high and low. Flicked on the turn signals, then the hazard lights and lowered and raised each of the power windows. Then he leaned forward to the dashboard put the AC at max and tuned into a station on the radio. We could barely hear it until he dropped the driver’s window - you could almost feel the AC pouring out - and turned up the volume on some soulful Oud music. Musa had a long, mute face, a handsome profile worthy of a fine work of sculpture, a slight grin emerged at the corners of his mouth as he slipped the Imperial into gear and without a sound the huge vehicle glided to the mound and gently pulled to a stop. Finally, Abu Ali started speaking in a surprisingly deep voice - it was much deeper than he was tall. I didn’t know that much Arabic but enough to figure out that he was telling us that this cream puff was owned by a little old man who hardly used it. It had 5,000 miles on it and was only one year old. It was a beautiful shade of blue tastefully set off with a lot of chrome. As he progressed he lowered his voice, everyone became quieter and leaned closer. How could anyone not want this car? And then he signaled to Musa. Musa redlined the engine and let it scream, slammed the La Baron into reverse and the car shot back thirty feet in three seconds and stopped instantly. Musa changed the station to some wild Turkish music and then very slowly drove forward, shimmying the wheels back and forth to make the car undulate like a python. We were mesmerized and hushed as Abu Ali extolled all the Chrysler’s options while Musa demonstrated them. For the part about the crimson red leather interior, Musa opened the driver’s door to show off the Naugahyde. When he finished, Musa quietly backed up the Imperial and then began slowly going back and forth to the mound as if the car were a cloud. Abu Ali said, “Do I hear 10,000 riyals?” Which was immediately countered, and the price of the Chrysler started to climb. Now, I don’t have any idea of what a brand new Chrysler Imperial actually cost in those days, so I’ll arbitrarily say 50,000 riyals (about $13,000.) Well the price quickly hit 40,000. I noticed that there was a young, handsome Saudi with a pencil thin mustache and three twenty-something friends also from equally wealthy families bidding against a portly Egyptian with a sweaty brow in a rumbled tan suit and an elderly Indonesian gentleman in a neat, white shirt with epaulettes wearing Sukarno sunglasses. The rest of us hoi polloi crowded around to watch the duel. The young Saudi blanched, and I turned to see a weathered Yemeni in filthy overalls, work boots and an electrician’s work belt waving a fistful of 100 riyal bills in his hand. His face was partially scarred with smallpox; he had a wide smile that revealed three gold front teeth and the rest rusted with a combination of cigarettes, betel nut and tooth decay. I’ll call him Yayha because later in Jeddah I knew a Yemeni much like him. The life of a Yemeni electrician was quite perilous, about a third of them being inadvertently electrocuted in their first week on the job. Blissfully unaware of Ohm’s law or Von Helmholtz’s first theorem, they pressed on: connecting red wires to red wires and learning the perils of grounding yourself to a high voltage line while standing in water. I imagined that the energetic Yayha was rolling in riyals because he was the electrical contractor of choice in the poorer neighborhoods of Riyadh. Rapid expansion had stressed the municipality beyond its limits, and service to these older areas was virtually ignored, so Yayha would climb a pole, tap into a live high voltage line, string dozens of illegal power lines down the street and bill his customers monthly. Abu Ali repeated, “Fifty five thousand.” The young Saudi turned to his pals, who half-heartedly patted their pockets and gazed at the sky. It soon became obvious that he didn’t have 56,000 riyals. Despite his aura of entitlement, the petulant young man was defeated. Much like the ancient camel market - it wasn’t about how carefully your ghuttra was folded. Do you have the cash? He was all ghutrra and no camels. Before Abu Ali closed the bid, the young man turned and walked off with his entourage, trying to give the impression that he didn’t care anyway. Abu Ali said, “Sold,” and the whole gallery went up in applause for Yayha. He acknowledged his fans like a bantam weight boxer who just won on a KO and handed Musa a paper bag full of hundred riyal bills. Musa didn’t even look in the bag as he slid out of the Imperial and Yayha hopped in. Musa bent over to power the front seat forward and show him a few of the controls before the grinning Yemeni drove off triumphantly in the Baby Blue La Baron. Wandering around the field, I saw plenty of cars and trucks but not the object of my affection. So I walked along the perimeter lined by haphazard rows of vehicles three deep. I turned at the corner to walk down the far side of the yard and twenty yards in front of me spotted a Saudi National Guard Volvo Laplander for sale. It was love at first sight as I hurried forward. But then, being highly sophisticated about Suqcraft, I slowed down and totally ignored the Volvo as I ambled past it to a battered Dodge pick-up truck with a hard 150,000 miles on the odometer and more on its alignment. As I pretended to examine the truck, a pudgy, middle-aged Saudi with a two-day beard on a large jaw, a white guffiyeh atop his closely shaved head, came up to introduce himself. “My name is Hamud,” he said in Arabic. “Oh, in Arabic there is no Tim. In Arabic my name is Khamis.” Because I was born on a Thursday, Yom al-Khamis. “Not this truck, that one,” and he swept his arm to the Volvo behind me. He must have pegged me on sight. He gave me the full rundown on the jeep. The ubiquitous Yemeni kid jumped in and fired up the engine, and it idled contently, as Hamud showed me the many features of this highly customized Saudi National Guard Volvo Laplander. 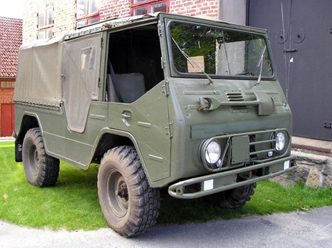 The floor was made of quarter-inch Swedish steel diamond plate to protect against land mines as well as lower the truck’s center of gravity and make it less likely to roll over. The drive shaft from the engine to the back axle was protected by a steel skid strip. The Volvo’s giant tires gave it about two feet of clearance between the ground and the skid plate. I hopped into the driver’s seat, and Hamud sat in the passenger seat to explain the stick transmission - and what a miracle transmission it was. Four gears in 2-wheel drive, four gears in 4-wheel drive that was engaged with a convenient lever in the cab, and then another four gears in Ultra Low 4-wheel drive mode. Basically in Ultra Low-Low the Volvo could climb out of a steep ravine like a mountain goat or tow a fire hydrant horizontally. We hit it off and start talking about the expatriate life in town, what we do and various rumors. He orders two Pepsis, and we are generally living it up as plays his latest Peter Gabriel cassette. Then he tells me a very funny story about the time as teenagers, he and his equally car-crazed cousin Ned scraped together enough money for the boat fare to France. They hitchhiked to Le Mans for the Grand Prix. Living on coffee, cigarettes, and sweet rolls, they arrived in the late afternoon of the start. But instead of finding a good spot to watch the race in town, they sneaked into the woods that bound one of the remote parts of the track. When darkness fell, they inched up to the shoulder of the road, as close to the track as they dared go, and laid down on the gravel. Prone on the shoulder they hear a race car approaching, louder and louder, it roars past at more than 200 miles per hour and its wake lifts their bodies a foot in the air and drops them. The cars come in packs. Rory and Ned are being bounced off the ground by race cars speeding three feet away from their heads. “I tell you Tim, it was like I was freaking flying.” They did this late into the night. It was one of those vivid scenes that depict the best part of being young, and foolish too.